A branch camp of the Atlanta Prisoner of War Camp was located in Grand Island during World War II. Over 300,000 Axis prisoners of war were held in America during World War II. In accordance with the Geneva Convention, these prisoners were often hired out to local farmers and businesses to replace the labor positions vacated by the war effort. To make working away from camp easier, branch camps were established around the base camps. Prisoners would be transferred from the base camp to the branch camp, where local employers would seek them out for different projects. Branch camps were usually located in existing structures. On July 9, 1944, Leo B. Stuhr of the Hall County Non-Stock Coop Labor Association announced that a branch camp would be created at the Dodge School in Grand Island. Twenty prisoners were sent to the school building to prepare it for the other prisoners. After it was ready for housing, about 100 POWs from Camp Atlanta stayed there to work in potato and beet fields Structural concerns about the building caused military leadership to close the camp. The commander of Camp Atlanta called the building a “fire trap.” Another branch camp was built near Grand Island. Known as the Hall County “Cornhusker” Camp (though officially known as “The Cornhusker Labor Detachment”), the camp was attached to the Grand Island Ordinance Plant. Since the plant produced ammunitions, prisoners were technically forbidden to work there, as the Geneva Convention banned POWs from working in directly war-related industries. As such, the details of the camp were kept secret. At one point, some of the POWs began to strike, but most of them did not protest; they figured every industry was related to the war effort in some way, so they might as well get their food and money. About 350 POWs worked there. 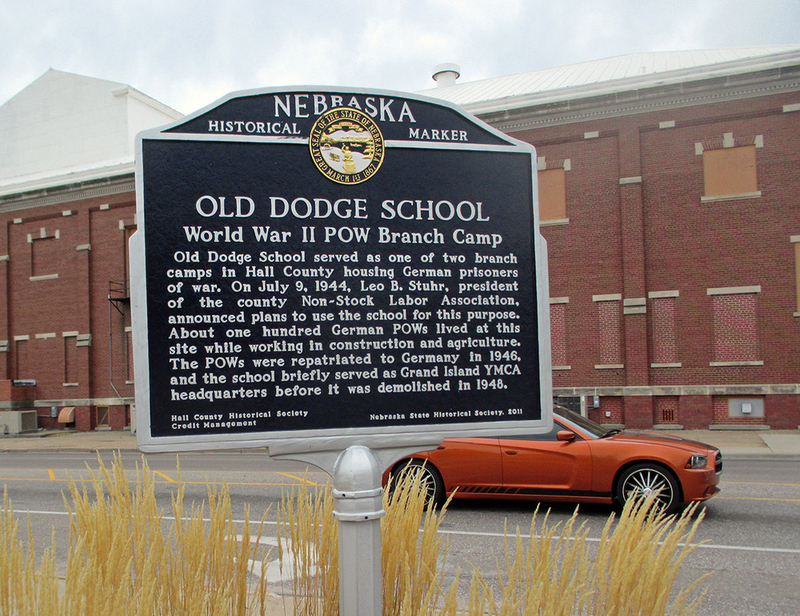 “Old Dodge School - World War II POW Branch Camp,” Explore Nebraska History, accessed April 18, 2019, https://mynehistory.com/items/show/263.